"רבי ישמעאל לא אמר המקרא 'ואספת דגנך' אלא בארץ ישראל, ורוב ישראל שרויין על אדמתן, שהעבודה בקרקע מצוה משום ישוב א"י, ולהוציא פירותיה הקדושים. ובועז ("גדול הדור", מדרש רות, סוף פרשה ה) היה זורה גורן השעורים בלילה (רות ג, ב) משום מצוה. (והטוען שיש בכך ביטול תורה, איננו צודק) וכאילו תאמר 'לא אניח תפילין מפני שאני עסוק בתורה'. הכי נמי לא יאמר 'לא אאסוף דגני מפני עסק התורה'. ואפשר אפילו שארי אומניות שיש בהם יישוב העולם, הכל בכלל מצוה" (חידושיו למסכת סוכה, לו ע"א, ד"ה דומה לכושי). וחזר על דבריו בביאורו לתורה "תורת משה" (מהד' קמא, דברים דף לו, פ' שופטים ד"ה מי האיש). "ונ"ל בזמן שישראל שרוים על אדמתם, מצוה לאסוף דגנך. לא לצורך פרנסתו וכו' אלא משום ישוב ארץ ישראל. ומשום הכי בועז זורה גורן השעורים, ואלישע שנים עשה צמדים (בקר) לפניו. ולא לבד עבודת קרקע, אלא לימוד כל אומנות משום ישוב וכבוד א"י. שלא יאמרו 'לא נמצא בכל א"י סנדלר ובנאי וכדומה' ויביאום מארצות רחוקים" עכ"ל. "כי אין ספק שהאדם נברא לעמל לעסוק בצרכי הגוף כדי לקיים הנפש ולהחזיקה במשכנה, ואדם לעמל יולד וכו' וכו' ומשולש בכתובים 'הגדלתי מעשי, בניתי לי בתים' (קהלת ב, ד) וכו' ובארץ ישראל היא כמו מצוה עלינו, כמ"ש רז"ל על הפסוק 'ונטעתם כל עץ מאכל' שיהא אדם זהיר בנטיעה, אף אתם כשאתם נכנסים לא"י לא תתעסקו אלא במטע תחילה!" ("מגדל עוז", עליית הבנין, פרק יא). "ייתכן לפרש דקיימא לן כר' ישמעאל (ברכות לה ע"ב) דהנהג בהם מנהג דרך ארץ, לכן אמר 'ובדבר הזה' שתתרוקנו (מלימוד התורה) בעת חרישה וזריעה, 'תאריכו ימים על האדמה אשר אתם באים שם לרשתה'. אבל לעסוק במסחרים ובחרישה בארצות הרחוקות (כלומר בהיותנו לא בארץ ישראל) זה אסור לבטל (תורה) עבור מותרות ותענוגות בני אדם" עכ"ל. וממשמעות דבריו כי להרבות בהשגת רווחים עבור "מותרות ותענוגות" בא"י, מותר ומצוה משום ישוב א"י! וזאת למרות שבעצם משך שעות העיסוק, האדם מתרוקן משקידת לימוד תורה. The article of the previous post on Jewish Action's website. Discovering Rav Elyashiv zt"l: My article in the current issue of "Jewish Action"
Rav Elyashiv zt"l was an opaque person. His public persona did not give us a sense of who he was. He was a closed book, and it is not clear that the book can ever be opened. Rav Elyashiv did not write in a systematic manner. Even his teshuvos, which he himself wrote, are only available as edited by his talmidim – who have inserted many ellipses, limiting the personal quality of Rav Elyashiv's writings. A teshuva written to the Kaliver Rebbe shlita. In 1985, the Kaliver Rebbe suggested a takkanah to recite the pesukim of Shema Yisrael following Aleynu every morning. The intent of the takkanah was to use that practice as a means to unite ourselves with the memory of the six million kedoshim of the Shoah. Rav Elyashiv begins his response by acknowledging that the Rebbe himself is a survivor of the Shoah, and that obviously the memory of that horrific time is always with the Rebbe in a way that Rav Elyashiv himself is not. Nevertheless, continues Rav Elyashiv, since the Rebbe asked his opinion, he would give it. Rav Elyashiv relates that shortly after the Shoah a proposal was made to institute a fixed, permanent fast day to remember that tragic period. At the times, recalls Rav Elyashiv, the Chazon Ish zt”l came out against the proposal, saying that our generation is one that had best remain silent, and is not worthy of introducing permanent enactments. This earlier repudiation of a similar proposal in and of itself, writes Rav Elyashiv, may suffice to negate the Rebbe's proposal. But, adds Rav Elyashiv, there is an additional issue here. The Kaliver Rebbe's expressed intent was that this practice serve as a time of contemplation l'hisyached im ha'kedoshim – “to unite with the martyrs” – is not a form of contemplation that we find in our classic sources, in Chazal. Rav Elyashiv here manifests an approach that is not unique, yet is noteworthy as a hallmark of the Lithuanian approach to Jewish practice: Sentiment is not an adequate basis for a public policy, even if the policy does not clash with any specific Halachic parameter. Even though can be no inherent Halachic objection to an individual repeating Shma after davening, its repetition as a formal ritual is objectionable in and of itself, so long as it is not grounded in a known form of Avodas Hashem sanctioned by Chazal. In a similar teshuva, Rav Elyashiv responds to an unidentified correspondent whose parents has perished in the Shoah, who wanted to purchase unused land in a cemetery and erect a monument there to memorialize his parents. Rav Elyashiv begins his response by considering the issues that may be involved in this case. We know that we are forbidden to emulate inherently non-Jewish rituals. The Rema (Shulchan Aruch, Yoreh Deah 178) defines inherently non-Jewish rituals as either ceremonies that manifest lewdness (pritzus), or ceremonies in which they engage for no apparent reason. Since the ceremonies are not grounded in any apparent reason, we must take into account that they are grounded in heathen worship or superstition (Darchei Emori). On the other hand, writes the Rema, non-Jewish rituals that are based on obvious and positive motivations may be adopted by us. Accordingly, it would seem, that the erection of such a monument – while admittedly a form of commemoration of non-Jewish origin – should be permissible, as it is obviously and positively grounded in the questioner's quest to honor his parents. However, continues Rav Elyashiv, the Gra (to Shulchan Aruch ibid.) rules stringently, that we are even forbidden to adopt non-Jewish rituals that are based on obvious and positive motivations. This would seem to rule out the erection of the monument. However, continues Rav Elyashiv, it is not clear that the practice of erecting commemorative monuments is, indeed, of non-Jewish origin. After all, we find Avshalom, who had no heirs, erecting for himself already during his lifetime, the commemorative monument known as Yad Avshalom. And the Gra would also allow us to adopt rituals common among non-Jews if they can be traced to our own practices as recorded in Tanach. On the other hand, writes Rav Elyashiv, we must also consider the use of the land of the cemetery for this purposes. The land of a cemetery is similar to the status of a synagogue in a location frequented by the public – viz., such land can only be used for its stated purpose – which, in this case, would seem to be the burial of the dead, not the erection of monuments. However, after citing and analyzing several sources, Rav Elyashiv concludes that there is sufficient Halachic basis to permit this manner of usage of cemetery grounds. But... concludes Rav Elyashiv, even though Din Torah allows for the erection of such a monument, from the perspective of Da'as Torah this is not a laudable venture (Ein ruach chachamim nocha heimena). Rather, the questioner should consider one of time-honored manners of commemorating the departed – e.g., by donating something [such as a light fixture, etc.] to a shul [to which one could, of course, affix a plaque], which would generate merit for the deceased and commemorate him at the same time. Here again Rav Elyashiv here manifests an approach that is not unique, yet is noteworthy – and which enhances our understanding of his teshuva to the Kaliver Rebbe: Halacha is the letter of the law (Din Torah), but the knowledge and observance of Halacha inculcates us with a “sensitivity” to its spirit (Da'as Torah). More precisely, perhaps, Halacha consists of both rulings (Din) and opinions (Da'as). In both these teshuvos Rav Elyashiv is clarifying that even if something may be permitted according to a narrow ruling, it may still remain out of sync with the value system of the Halachic minded. And, in cases where the questioner is motivated by sentiment, the spirit of the law should definitely prevail. Most of this teshuva is clearly missing. As it “starts” with paragraph Gimmel (3). But the part of the teshuva that has been published is fascinating. The question under discussion is the propriety of exaggerating in stories about Gedolim. Rav Elyashiv writes that it is inappropriate to do so. He cites the Taz in Yoreh Deah 344. There the Shulchan Aruch rules that in a eulogy we mention the good traits of the departed and we “add a bit” (mosifin ketzas). On this ruling the Taz asks, what difference does it make if a lie is a big lie or small lie?! A lie is a lie! Rav Elyashiv explains the Shulchan Aruch's meaning: You can add something that you can assume – based on your knowledge of the deceased – that he would have done were he to be in that situation. The next teshuva concerns a related issue. The teshuva is addressed to Rabbi Boruch Horovitz shlita, Rosh HaYeshiva of Yeshivas Dvar Yerushalayim. Rabbi Horovitz published Matteh Levi, the responsa of his grandfather, Rabbi Marcus Horovitz zt”l, who was the Orthodox rabbi of the Grossgemeinde in Frakfurt-am-Main. In one of the teshuvos, Rabbi Horovitz discusses the renowned incident of the “Cleves Get,” and argues in favor of the position of the Frankfurt Beis Din nullifying the get – a ruling that was opposed by virtually every other Halachic authority of 18th century world Jewry. Rav Elyashiv begins by stating the facts of the case, and postulating that were the controversy to have arisen at a time in which a Sanhedrin existed, the Frankfurt Beis Din would have been in violation of the Torah prohibition of Lo Sasur. Moreover, writes Rav Elyashiv, even in later generations there still exists the concept of “The Lord stands with the community of God” (Elokim nitzav b'adas Keil), and the majority of Chachmei Yisrael cannot be mistaken. Rav Elyashiv continues that, be that as it may, he could not understand why Rabbi Horovitz reprinted all the pronouncements and bans issued by the Frankfurt Beis Din, which were derisive and degrading of great Rabbonim of the time. Granted, at the time of the controversy, when tempers were flaring, excessive zeal understandably may have led the Frankfurt Beis Din to act inappropriately – but what justification was there to bring these matters up now? There is no doubt that so many years after the controversy died down, when all the combatants have already been for so long in the Olam HaEmes, that they can have no pleasure from the re-opening of the issue. And, concluded Rav Elyashiv, even if your grandfather's teshuva and its publication can somehow be justified as an halachic excursus, how can you justify the publication of the scandalous material surrounding the episode? Such publication surely clashes with Kavod HaTorah. 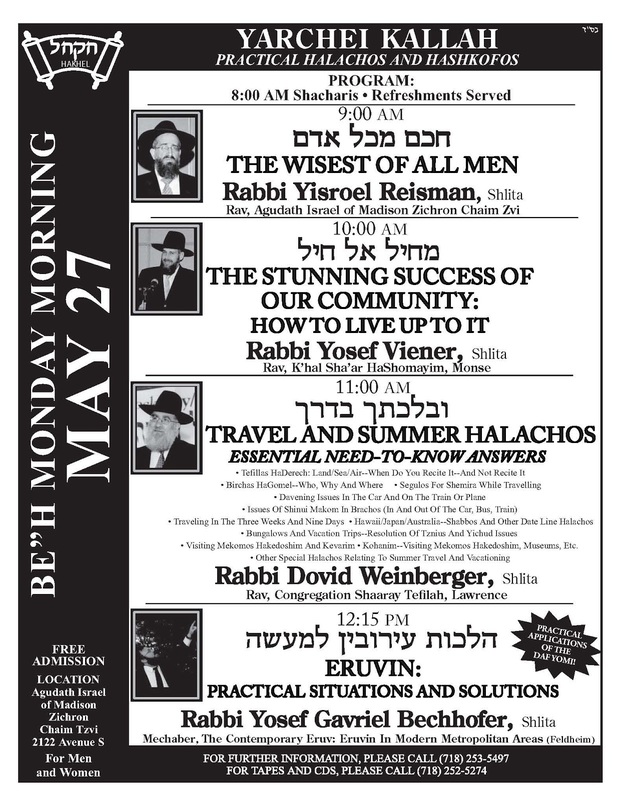 In these two teshuvos Rav Elyashiv again teaches that there is Din Torah and there is Da'as Torah. More precisely, perhaps, Halacha consists of both rulings (Din) and opinions (Da'as). In both these latter teshuvos Rav Elyashiv is clarifying that our recollections of individuals and events must also be subjected to the scrutiny of the value system of that complements narrow Halachic parameters. In this teshuva, Rav Elyashiv considers the status of a non-Jew who studies Torah. He quotes a remarkable Meiri. The Meiri remarks that a Jew who attempts to grow in piety by making a holiday – be it of his own invention, or observing our days of rest – is punished. On the other hand, if a non-Jew attempts to grow in piety in any other manner, he is to be encouraged. The Meiri asserts that such voluntary piety on the part of a non-Jew is to be regarded by us as akin to voluntary sacrificial offerings brought by a non-Jew, which we are told to accept. As far as a non-Jew learning Torah, writes the Meiri, it depends if he is learning merely to gain knowledge of Judaism – which should not be allowed – or to grow in piety – which should be encouraged, even if his studies concern mitzvos that are not included in the Sheva Mitzvos Bnei Noach, the Seven Noahide Laws. At first glance, the Meiri's position seems difficult, since the Gemara itself only lauds the non-Jew's Torah learning if it is focused on one of the Sheva Mitzvos. Rav Elyashiv resolves the issue, explaining that the Meiri's opinion is that since a non-Jew is permitted to perform any mitzvah other than those that concern holidays, once he undertakes to fulfill any mitzvah it has for him the same status as the Sheva Mitzvos. Why, then, did Chazal express themselves in a manner that might lead us to mistakenly limit the learning of a non-Jew to studies of the Sheva Mitzvos? Rav Elyashiv suggests that it was so as to teach us that the learning must pertain to a mitzvah that can be fulfilled in our day and age. The implication is that just as the Sheva Mitzvos are always applicable, so too whatever the non-Jew studies must pertain to a mitzvah that is currently applicable. This teshuva, written in 2004, is addressed to the American posek Rabbi Feivel Cohen shlita. Rabbi Cohen posed the unfortunate contemporary question, whether it is permissible to inform the authorities of the activities of a child molester. Rav Elyashiv bases his response on Teshuvos HaRashba (3:393) who writes that when there are clear witnesses that someone has committed crimes, Beis Din is allowed – even in our day and age – to impose upon him monetary fines and corporal punishment. The Rashba asserts that this is a part of our responsibility of kiyum ha'olam, to sustain the world. For were we to limit our punishments to the precise parameters that we find in Torah, our code of law would not suffice to maintain society. It is therefore appropriate for Beis Din to proactively enact appropriate laws in addition to the laws of the Torah – so long as the government of the time and place gives us the authority to do so. Rav Elyashiv adds that even if the government does not grant us such autonomous authority, it remains incumbent on Beis Din to ensure tikkun ha'olam. Therefore, even if we cannot ourselves impose the penalties, the tikkun ha'olam of curtailing molestation is sufficient reason to inform the authorities of the perpetrator (so long, qualifies Rav Elyashiv, as the charge is borne out by evidence). In these last two teshuvos we come full circle. Here too, Da'as Torah influences and even shapes practice – beyond the scope of narrow Halachic rulings. In the case of the non-Jew learning Torah, it is the Meiri whose Da'as Torah rejects the narrow limitation of Sheva Mitzvos, permitting any learning that is beneficial to the spiritual state of the non-Jew. In the case of the molester, it is the Rashba whose Da'as Torah rejects the narrow limitation of Beis Din's powers, encouraging all that is necessary to sustain society. In both cases, of course, Rav Elyashiv follows in the footsteps of the Rishonim he cites. All of the teshuvos that we have seen relate more to public policy than to normative Halachic practices. These are not “beracha on corn flakes” she'eilos. Decisions in these areas require a scope of vision and a depth of sensitivity. Here we have tried to get beyond the opacity in which Rav Elyashiv zt”l was often hidden. May his merit sustain us, and may his Torah – together with the Torah of all Gedolei Yisroel of all times – guide us along the path of Avodas Hashem towards the ultimate tikkun olam b'malchus Shaddai. It is interesting to note that Rabbi Yosef Dov Halevi Soloveitchik zt”l was opposed not only to enacting special commemorative days, but even to commemorative kinnos. He maintained that only the Rishonim had the capacity to author prayers, and that no later kinnos could be added to the Tisha b'Av liturgy (heard by the author from Rabbi Soloveitchik, Tisha b'Av 1980). Rav Elyashiv suggests instead to learn Mishnayos for the sake of the martyrs. Learning is always good, not matter what its specific catalyst may be. Based on the Torah's admonition: B'chukoseihem lo seileichu. This usage of the term Da'as Torah is unrelated to its more controversial use as an assertion of the binding authority of opinions expressed by Torah sages. It is used by Rav Elyashiv, rather, to indicate broader sensitivities that complement narrow Halachic rulings. The Grossgemeinde, “Larger Community,” was the general community which included both Orthodox and Reform constituencies, although the Reform faction dominated. Rabbi Samson Raphael Hirsch zt”l was famous for asserting that it was forbidden to be a member of the Grossgemeinde, and for founding the secessionist Austrittsgemeinde, “Leaving Community.” However, even after Rav Hirsch formed the Austrittsgemeinde and developed it into a thriving entity, the majority of Orthodox Jews in Frankfurt remained affiliated with the Grossgemeinde – in many case holding dual memberships in the two organizations. Rabbi Horovitz was the Orthodox rabbi of the Grossgemeinde from 1882 until his death in 1910. During 1766–67, a great controversy flared up, which was to become known as the Cleves get (bill of divorce), one of the causes célèbres of the 18th century. Though its focal point was Frankfurt, it came to involve most of the great scholars of the day. On Elul 8, 5526 (August 14, 1766), Isaac (Itzik), son of Eliezer Neiberg of Mannheim, married Leah, daughter of Jacob Guenzhausen of Bonn. On the Sabbath following the wedding the bridegroom took 94 gold crowns of the dowry and disappeared. After an extensive search he was found two days later in the house of a non-Jew in the village of Farenheim and brought home. A few days later Isaac informed his wife's family that he could no longer stay in Germany because of the grave danger which threatened him there, and that he was obliged to immigrate to England. He declared his willingness to give his wife a divorce in order to prevent her from becoming an agunah. His offer was accepted, and Cleves on the German-Dutch border was selected as the place for the get to be given. Consequently, on the 22nd of Elul, Israel b. Eliezer Lipschuetz, the av bet dinof Cleves, effected the divorce. Leah returned to Mannheim and Isaac proceeded to England. When his father learned of the divorce, he suspected that the whole affair had been contrived by the woman's relatives to extort the dowry money from Isaac. He turned to R. Tevele Hess of Mannheim who invalidated the get on the grounds that in his view the husband was not of sound mind when he delivered it. Hess, not relying upon his own judgment, applied to the bet din of Frankfurt and to Naphtali Hirsch Katzenellenbogen of Pfalz, Eliezer Katzenellenbogen of Hagenau, and Joseph Steinhardt of Fuerth, requesting their confirmation of his ruling. The bet din of Frankfurt, headed by Abraham b. Ẓevi Hirsch of Lissau, not only agreed, but demanded that Lipschuetz himself declare the get invalid and proclaim Leah to be still a married woman. The rabbis of Pfalz, Hagenau, and Fuerth, on the other hand, upheld Lipschuetz, declared the divorce valid, and the woman free to remarry. Both sides appealed to all the rabbinical authorities of the time. The rabbi of Cleves received the support of almost all of the leading scholars of the generation, among them Saul b. Aryeh Leib Loewenstamm of Amsterdam, Jacob Emden, Ezekiel Landau of Prague, Isaac Horowitz of Hamburg, David of Dessau, Aryeh of Metz, Elhanan of Danzig, Solomon b. Moses of Chelm, and ten scholars of the klaus (bet-midrash) of Brody. The bet din of Frankfurt was virtually alone in its opposition. The moving spirit in the dispute was the Frankfurt dayyan, Nathan b. Solomon Maas, on whose initiative the Frankfurt rabbis even went so far as publicly and with solemn ceremony to commit to flames the responsa of the Polish rabbis in protest against their intervention in favor of Lipschuetz. The couple finally remarried and out of deference to the opinion of Rabbi Abraham of Frankfurt, no blessings were pronounced at the ceremony. Instead the groom said that "with this ring you are still married to me." The complete episode of the Cleves divorce was recorded in Or ha-Yashar (Amsterdam, 1769) by Aaron Simeon Copenhagen who had followed the events and who had himself played a part in the granting of the get. Israel Lipschuetz devoted no less than 37 of his responsa to the polemic in his Or Yisrael (Cleves, 1770). In several teshuvos Rav Elyashiv addresses the issue of why, strictly speaking, Halacha does not allow a Jew to desecrate the Shabbos to save the life of a non-Jew. While his explanation is beyond the scope of this essay, it is noteworthy that Rav Elyashiv feels compelled to write apologetically on this issue. By a random Google search just discovered this extremely useful compendium is now online!!! So much for the objectivity of the scientific world. The Talmud Yerushalmi Institute announces the “Or Layesharim” elucidated Talmud Yerushalmi authored by Rabbi Yehoshua Buch. The editions are available in print and PDF (http://www.talmudyerushalmi.org/talmud-yerushalmi-mevoar/). The commentary is seizing the growing interest in the Talmud Yerushalmi and Torat Eretz Yisrael in Israel and the United States. The OU which as drawn 1,800 daily listeners to its Bavli Daf Yomi cycle has now launched its new Talmud Yerushalmi daf yomi cycle. The importance of the Talmud Yerushalmi lies in it being the source for the methods of learning and interpretation of the Mishnah and Tanaitic texts which are quite different from that of the Talmud Bavli. In addition, the Talmud Yerushalmi contains much halakhic and aggadic material that does not exist in the Talmud Bavli and teaches us much about the laws and customs of Eretz Yisrael through out the generations. The uniqueness of the commentary is its reliance on the manuscripts and genizah fragments of the Talmud Yerushalmi that survived, through a meticulous examination of the unique language and terminology of the Talmud Yerushalmi using contemporary studies. It also draws upon traditional commentaries and Academic studies (e.g. Lieberman, Epstein, Halivni) from a broad variety of fields to help determine the correct interpretation of the Talmud Yerushalmi.